New Mercedes A-Class set for summer launch. The Mercedes A-Class is due to arrive in Ireland in summer. Mercedes' smallest car - the A-Class - has been re-vamped and is due for launch in Ireland this summer. New engines, a bigger boot and advanced safety features are promised. 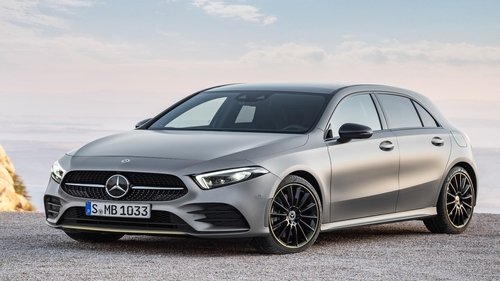 It's the car Mercedes says has given it's range a youthful appeal, with those moving to the brand and opting for an A-Class being some thirteen years younger than those opting for a Mercedes for the first time. That is probably as much to do with the needs of younger couples with children as anything else, but is still puts the car at the premium end of that segment of the market. A lot has changed since that quirky A-Class was launched and achieved infamy when it failed a Scandinavian "moose crash" test. Today the car has moved on to take quite a few styling cues from bigger and more smartly -designed cars in the range, especially the coupe versions. A new range of engines sees the car arriving with an entry-level 1.4 petrol and moving up to a 2.0 litre petrol and then there is a 1.5 diesel engine. Minimum engine output will be 116 horse power and the maximum 224 horse power. Prices and full specifications are not known at this stage but Mercedes will have to offer not just a badge to entice people now being lured by good quality compact SUV's and slightly bigger ones too. The interior of the new A-Class. The infotainment screen is wide and high-resolution. Price and specification will, of course, determine the popularity of the car - the current model comes in at just over €27,000 for the entry-level - and how many youthful customers will come calling. Mercedes in Ireland has had a fairly major re-alignment of prices to increase market share and the new brand entry-level model is a good opportunity to attract non-traditional buyers, as long as the price is right. Family requirements have been addressed in the new version - the boot is bigger at 370 litres (not enormous, it has to be said), there is easier access to the rear seats and there is also more front and rear headroom and also more shoulder and elbow room. Prices are due to be announced in time to attract 182 registration buyers and the car is due to arrive just after those July registrations begin.